Darby Pipe Bending Sets for HPB32-42"
All Darby Bending Machines require a bending set and/or bending die (Bare or Lined) for bending a desired pipe size. A bending set and/or bending dies are required for each diameter of pipe that is bent. The largest pipe size in each pipe-bending machine requires a die only for bare pipe. Coated/lined pipe requires liners on all bending set pieces or bending machine contact points (e.g. stiff back bed, pin-up bed). All bending sets are manufactured oversized to protect anti-corrosion coating on the pipe. If a thin-film epoxy coating is used as an anti-corrosion coating, a lined bending set is necessary. 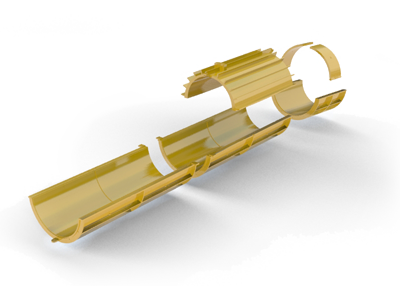 All bending sets are designed and manufactured to conform to all API-5L pipe sizes. Click on product description to view image. For use with bare pipe, coal tar coated pipe, asphalt coated pipe, and polyurethane coated pipe up to 5mm of thickness.